Native PhD's for Leadership Roles in Research. To be published in Canadian Journal of Native Education (Winter, 2009). Abstract: Native peoples in Alaska have usually been the subjects of research rather than the ones responsible for conducting it. However, the role of Alaska Natives in research is changing due to a concerted effort on the part of the University of Alaska and Native people themselves to develop new programs aimed at recruiting and preparing Native scholars in all academic fields who can take on leadership roles and bring an Indigenous perspective to the policy arenas at the local, state, national and international levels. This article will describe the activities underway, their rationale, and the implications for research. Indigenous peoples throughout the world have sustained their unique worldviews and associated knowledge systems for millennia, even while undergoing major social upheavals as a result of transformative forces beyond their control. Many of the core values, beliefs and practices associated with those worldviews have survived and are beginning to be recognized as having an adaptive integrity that is as relevant for today’s generations as it was for past generations. The depth of indigenous knowledge rooted in the long inhabitation of a particular place offers insights that can benefit everyone, from educator to scientist, as we search for a more satisfying and sustainable way to live on this planet. Actions taken by indigenous peoples themselves over the past twenty years have begun to explicate indigenous knowledge systems and ways of knowing in ways that demonstrate their inherent validity and adaptability as complex knowledge systems with a logic and coherence of their own. As this shift evolves, it is not only indigenous people who are the beneficiaries, because the issues that are being addressed are of equal significance in non-indigenous contexts (Barnhardt and Kawagley 2005). Many of the problems that are manifested under conditions of marginalization have gravitated from the periphery to the centre of industrial societies, so the new insights that are emerging from indigenous societies are of equal benefit to the broader community. The tendency in past education and research initiatives aimed at engaging indigenous people, most of which were designed from a non-indigenous perspective, has been to focus on how to get indigenous people to understand the western/scientific view of the world. Until recently there was very little attention given to how western scientists and educators might better understand indigenous worldviews, and even less on what it means for participants when such divergent systems coexist in the same person, organization or community. It is imperative, therefore, that we come at these issues on a two-way street, rather than view the problem as a one-way challenge to get indigenous people to buy into the western system. Indigenous people may need to understand western society, but not at the expense of what they already know and the way they have come to know it. Non-indigenous people, too, need to recognize the co-existence of multiple worldviews and knowledge systems, and find ways to understand and relate to the world in its multiple dimensions of diversity and complexity. The aspirations of indigenous peoples extend beyond serving in a passive or advisory role in response to someone else’s policy or research agenda - they include shaping the terms of that agenda and serving as active participants in its implementation. One of the most persistent constraints in fulfilling those aspirations is for indigenous peoples to be recognized as having the qualifications and expertise to be valued partners in the research and policy-making process. The strategy to overcome those constraints has focused on the preparation of indigenous scholars who have a high level of research and policy expertise and an in-depth understanding of the dynamics at the interface between indigenous knowledge systems and western institutions. Economic models and policies in modern Arctic societies are traditionally designed and legitimated in administrative and political institutional contexts outside the Arctic. A key concern of future research should be to have a critical look at these contexts aiming at gaining new grounds for decision-making . . . Indigenous peoples of the Arctic have managed to carve out political regions in which they make up the majority, or at least a significant part of the population. Based upon this reality, indigenous peoples and communities are now actively involved in setting research agendas. It is thus obvious that research agendas set by indigenous peoples themselves or reflecting indigenous cultures will be a key factor in setting research priorities for the next decade (Arctic Council 2004). While these issues are of critical concern for indigenous peoples and communities in the circumpolar region, their significance is by no means limited to the Arctic—these are issues of broad international importance, as reflected in the United Nations report on the Status and Trends Regarding the Knowledge, Innovations and Practices of Indigenous and Local Communities (Helander-Renvall 2005). Recognizing the need to address these issues in a systematic way, the U.S. National Science Foundation, Office of Polar Programs convened a “Bridging the Poles” workshop in Washington, D.C. in June, 2004, bringing together scientists, educators and media specialists to outline an education and research agenda for the International Polar Year (IPY). Among their recommendations was the following: “Communication with Arctic indigenous peoples must include developing a new generation of researchers from the Arctic who actively investigate and communicate northern issues to global populations and decision makers….” (Pfirman et al. 2004). Arctic residents, including indigenous populations, are meaningfully engaged in developing and implementing polar research, education, and outreach, including community concerns and traditional knowledge, with an increase in the number Arctic residents—especially indigenous Alaskans—with PhDs. Focus on building capacity within indigenous communities for conducting research (including local collection of data) and education/outreach in both traditional and nontraditional venues. Community-based educational components should be developed for existing and planned long-term observation networks, … tailored by community members to address community relevant issues, and to involve both native elders and scientists. Arctic research projects by Native people, for Native people, will involve finding funding sources and connecting them with Native communities. Recognizing that the Native peoples have knowledge and tradition to share with other populations is an important first step towards their involvement. Their presence in the field of education, both traditional and non-traditional, will assist in encouraging more Natives, and in providing a bridge to other cultures… (Pfirman et al. 2004). Since western scientific perspectives influence decisions that impact every aspect of indigenous peoples’ lives, from education to fish and wildlife management, indigenous people themselves have taken a strong active role in re-asserting their own traditions of science in various research and policy-making arenas. As a result, there is a growing awareness of the depth and breadth of knowledge that is extant in many indigenous societies and its potential value in addressing issues of contemporary concern, including the adaptive processes associated with a rapidly changing environment. The incongruities between western institutional structures and practices and indigenous cultural forms are not easy to reconcile. The complexities that come into play when two fundamentally different worldviews converge present a formidable challenge. The specialization, standardization, compartmentalization, and systematization that are inherent features of most western bureaucratic forms of organization are often in direct conflict with social structures and practices in indigenous societies, which tend toward collective decision-making, extended kinship structures, ascribed authority vested in elders, flexible notions of time, and traditions of informality in everyday affairs (Barnhardt 2002). It is little wonder then that western bureaucratic forms have been found wanting in addressing the needs of traditional societies. Indigenous societies, as a matter of survival, have long sought to understand the irregularities in the world around them, recognizing that nature is underlain with many unseen patterns of order. For example, out of necessity, Alaska Native people have long been able to predict weather based upon observations of subtle signs that presage what subsequent conditions are likely to be. With the vagaries introduced into the environment by accelerated climate change in recent years, there is a growing interest in exploring the potential for complementarities that exists between what were previously considered two disparate and irreconcilable systems of thought (Krupnik and Jolly 2001; Barnhardt and Kawagley 1999). The sixteen distinct indigenous cultural and linguistic systems that continue to survive in communities throughout Alaska have a rich cultural history that still governs much of everyday life in those communities. For over six generations, however, Alaska Native people have been experiencing recurring negative feedback in their relationships with the external systems that have been brought to bear on them, the consequences of which have been extensive marginalization of their knowledge systems and continuing dissolution of their cultural integrity. Though diminished and often in the background, much of the Native knowledge systems, ways of knowing and world views remain intact and in practice, and there is a growing appreciation of the contributions that indigenous knowledge can make to our contemporary understanding in areas such as medicine, resource management, meteorology, biology, and in basic human behavior and educational practices (Kawagley et al. 1998; James 2001). In an effort to address these issues in a more comprehensive way and apply new insights to address long-standing and seemingly intractable problems, in 1995 the University of Alaska Fairbanks, under contract with the Alaska Federation of Natives and with funding support from the National Science Foundation Rural Systemic Initiative Program, entered into a ten-year applied research endeavor in collaboration with Native communities. The activities associated with the Alaska Rural Systemic Initiative (AKRSI) were aimed at fostering connectivity and complementarities between the indigenous knowledge systems rooted in the Native cultures that inhabit Alaska and the formal education systems that have been imported to serve the educational needs of Native communities. The underlying purpose of these efforts was to implement a set of research-based initiatives to systematically document the indigenous knowledge systems of Alaska Native people and to develop educational practices that appropriately incorporate indigenous knowledge and ways of knowing into the formal education system. The initiatives in Table 1 below constituted the major thrusts of the AKRSI applied research and educational reform strategy. Over a period of ten years, these initiatives served to strengthen the quality of educational experiences and consistently improve the academic performance of students in participating schools throughout rural Alaska (AKRSI Annual Report 2005). In the course of implementing the AKRSI initiatives, we came to recognize that there is much more to be gained from further mining the fertile ground that exists within indigenous knowledge systems, as well as at the intersection of converging knowledge systems and world views. 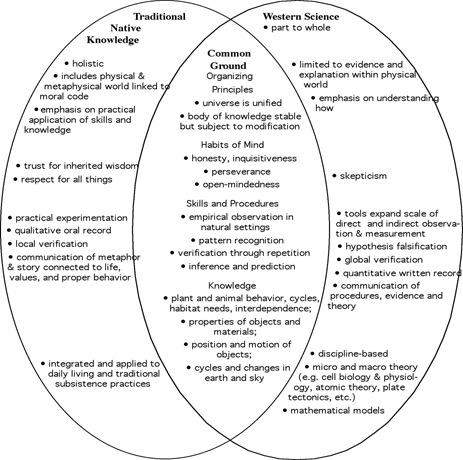 Figure 1 below captures some of the critical elements that come into play when indigenous knowledge systems and western science traditions are put side-by-side and nudged together in an effort to develop more culturally sensitive interaction. The implications for the research and education processes imbedded in the three domains of knowledge represented in the overlapping ovals are numerous and of considerable significance. From an Hegelian perspective, they could be characterized in terms of thesis, antithesis and synthesis—the latter being the ‘common ground”’ depicted in the diagram. The list of qualities associated with each of the three knowledge domains lend themselves to a comprehensive research policy agenda in their own right. In the Handbook for Culturally Responsive Science Curriculum prepared by AKRSI for Alaska schools, Sidney Stephens explains the significance of the various components of this diagram as follows, “It has to do with accessing cultural information, correlating that information with science skills and concepts, adjusting teaching strategies to make a place for such knowledge, and coming to value a new perspective” (Stephens 2000). Indigenous scholars discovered that indigenous knowledge is far more than the binary opposite of western knowledge. As a concept, indigenous knowledge benchmarks the limitations of Eurocentric theory -- its methodology, evidence, and conclusions – re-conceptualizes the resilience and self-reliance of indigenous peoples, and underscores the importance of their own philosophies, heritages, and educational processes. Indigenous knowledge fills the ethical and knowledge gaps in Eurocentric education, research, and scholarship. By animating the voices and experiences of the cognitive ‘other’ and integrating them into the educational process, it creates a new, balanced centre and a fresh vantage point from which to analyze Eurocentric education and its pedagogies (Battiste 2002). When engaging in the kind of comparative analysis of different knowledge systems outlined above, any generalizations should be recognized as indicative and not definitive, since indigenous knowledge systems are diverse themselves, and are constantly adapting and changing in response to new circumstances. The qualities identified for both indigenous and western systems represent tendencies rather than fixed traits, and thus must be used cautiously to avoid overgeneralization (Gutierrez and Rogoff 2003). At the same time, it is the diversity and dynamics of indigenous societies and their emergence as a field of study in their own right that we continue to capitalize upon. The expansion of the knowledge base associated with the interaction between western science and indigenous knowledge systems has contributed to an emerging body of scholarly work regarding the role that local observations and indigenous knowledge can play in deepening our understanding of human and ecological processes, particularly in reference to the experiences of indigenous peoples. Most critical in that regard for purposes of bringing indigenous knowledge out of the shadows in Alaska was the seminal scholarly work of Angayuqaq Oscar Kawagley, whose research revolutionized our understanding of the role of indigenous world views and ways of knowing and their relevance to contemporary matters (Kawagley 1995). As the first Yupiaq to receive a PhD, his insights opened the door for indigenous perspectives to take on new life as a lens through which to better understand the world around us. The Alaska Native organizations and personnel associated with the Alaska Rural Systemic Initiative, including Oscar Kawagley, played a pivotal role in developing the conceptual and political underpinnings on which a new PhD Program in Indigenous Studies has been developed at the University of Alaska Fairbanks. The Alaska Federation of Natives urged the development of advanced graduate studies addressing indigenous concerns with a formal resolution adopted in 2004. Over the next two years we assembled a list of over 100 Alaska Native people with master degrees who expressed an interest in pursuing a PhD. Drawing upon the inspiration and success of the Maori people in New Zealand in preparing over 500 Maori PhD’s over a five year period, we acquired planning funds from the Andrew W. Mellon Foundation and in the fall of 2007 we brought together 55 Alaska Natives with PhD aspirations for an Indigenous PhD Planning Workshop. Out of this workshop we were able to identify the areas of interest around which a new PhD program could be built, as well as the support structure and delivery system that would be needed to implement the program. The five areas of emphasis that were identified were indigenous education, languages, research, leadership and knowledge systems. The program makeup was then developed and is now undergoing review at the University of Alaska Fairbanks. The new PhD Program in Indigenous Studies will integrate the tools and approaches of the natural and social sciences in a cross-cultural and interdisciplinary framework for analysis to better understand the emerging dynamic between indigenous knowledge systems, western science and higher education. We will focus on the interface between indigenous knowledge and science on an international scale, with opportunities for collaboration among indigenous peoples from throughout the circumpolar region. It will also draw and build upon past and current initiatives that seek to utilize indigenous knowledge to strengthen the curriculum and pedagogical practices in K-16 education. With numerous research initiatives currently in various stages of development and implementation around the circumpolar region, there is an unprecedented window of opportunity to open new channels of communication between scientists, policy makers and indigenous communities, particularly as they relate to those research activities that are of the most consequence to indigenous peoples (e.g., effects of climate change, environmental degradation, contaminants and subsistence resources, health and nutrition, bio/cultural diversity, Arctic observation networks, natural resource management, economic development, resilience and adaptation, community viability, cultural sustainability, language and education). To the extent that there are competing bodies of knowledge (indigenous and western) that have bearing on a comprehensive understanding of particular research initiatives associated with indigenous-related themes, we propose to offer opportunities for indigenous PhD candidates to be embedded with on-going research initiatives to contribute to and learn from the research process. In addition to conducting research on the inner dynamics of indigenous knowledge systems, the PhD students will also be examining the interplay between indigenous and western knowledge systems, particularly as it relates to scientific processes of knowledge construction and utilization. In January, 2005, the University of Alaska Fairbanks organized an international Indigenous Knowledge Systems Research Colloquium which was held at the University of British Columbia, bringing together a representative group of indigenous scholars from the U.S., Canada and New Zealand “to identify salient issues and map out a research strategy and agenda to extend our current understanding of the processes that occur within and at the intersection of diverse world views and knowledge systems”. A second gathering of indigenous scholars took place in March, 2005 focusing on the theme of “Native Pedagogy, Power, and Place: Strengthening Mathematics and Science Education through Indigenous Knowledge and Ways of Knowing”. In Table 2 below is a list of research topics identified by the participants in these two events as warranting further elucidation as they relate to our understanding of the role of indigenous knowledge systems in contemporary research and education contexts. Drawing on the seminal work of the distinguished scholars who participated in these meetings, the research agenda outlined above is intended to advance our understanding of the existing knowledge base associated with indigenous knowledge systems and will contribute to an emerging international body of scholarly work regarding the critical role that local knowledge can play in our understanding of global issues (Barnhardt and Kawagley 2005). Alaska Natives have been at the forefront in bringing indigenous perspectives into a variety of policy arenas through a wide range of research and development initiatives. In the past few years alone, the U.S. National Science Foundation has funded Alaska projects incorporating indigenous knowledge in the study of climate change, the development of indigenous-based math curriculum, a geo-spatial mapping program, the effects of contaminants on subsistence foods, observations of the aurora, and alternative technology for waste disposal. In addition, Native people have formed new institutions of their own (the Consortium for Alaska Native Higher Education, the Alaska Native Science Commission and the First Alaskans Institute) to address some of these same issues through an indigenous lens. A major limitation in all these endeavors, however, has been the severe lack of indigenous people with advanced degrees and research experience to bring balance to the indigenous knowledge/western science research enterprise. One of the long-term purposes of the current initiative is to develop a sustainable research infrastructure that makes effective use of the rich cultural and natural environments of indigenous peoples to implement an array of intensive and comparative research initiatives, with partnerships and collaborations in indigenous communities across the U.S. and around the circumpolar world. These initiatives are intended to bring together the resources of indigenous-serving institutions and the communities they serve to forge new configurations and collaborations that break through the limitations associated with conventional paradigms of scientific research. Alaska, along with each of the other participating indigenous regions, provides a natural laboratory in which indigenous graduate students and scholars can get first-hand experience integrating the study of indigenous knowledge systems and western science. The timing of this initiative is particularly significant as it provides a pulse of activity that capitalizes on new indigenous-oriented academic offerings that are emerging in at least thirty-five institutions around the world (Alaska Native Knowledge Network 2007). While the University of Alaska Fairbanks has had a dismal track record of graduating only four Alaska Natives with a PhD over its entire 90-year history, there is now a strong push, due in large part to the initiative of Alaska Native students and leaders, to bring resources to bear on the issue. This includes drawing upon programs and institutions from around the world to provide students with an opportunity to access expertise from a variety of indigenous settings, as well as to identify indigenous scholars to serve as a member of their graduate advisory committee to help guide their research in ways that foster cross-disciplinary collaboration and comparative analysis. At the same time, students from partner institutions engaged in related research will be eligible to participate in UAF-sponsored courses and research initiatives with a comparable goal of promoting scholarly cross-fertilization and synergy. Video and audio conferencing and Internet-based technologies will be utilized to support an array of course offerings and joint seminars on topics of interest to a cross-institutional audience. Such shared course offerings linking faculty and students across multiple institutions have already been piloted and the infrastructure is in place to expand to the program areas outlined above. Each partner institution will bring a unique perspective to the research initiatives that will serve to inform and expand the capacity of the overall effort. Close attention will also be given to addressing issues associated with ethical and responsible conduct in research across cultures and nations, employing the ‘Mataatua Declaration on Cultural and Intellectual Property Rights of Indigenous People,” “Principles for the Conduct of Research in the Arctic’ and the ‘Guidelines for Respecting Cultural Knowledge’ (Alaska Native Knowledge Network 2001). to encourage participation of and knowledge sharing with Arctic communities in its activities, so as to bring more students from Arctic societies to register at the Ph.D. level (http://www.hum.ku.dk/ipssas/about.html). Many indigenous organizations see the potential of the University of the Arctic as an institution in which they may positively influence northern research and education. The opportunity to shape and develop the curriculum exists, as well as the possibilities for inclusion of traditional knowledge holders in teaching. This possibility would be a major shift from professionalized faculty to a more open classroom, which respects different forms and authority of knowing and teaching (Arctic Council 2004). The University or Alaska Fairbanks will help actualize this potential through the formation of an Indigenous PhD Thematic Network under the auspices of the UArctic. The international partnerships associated with this endeavor are essential to its success, particularly as it relates to gaining a deeper understanding of the relationship between indigenous knowledge systems and western science. The primary benefits of such collaboration on research related to indigenous knowledge systems are the opportunities for scholars and graduate students to engage in cross-cultural comparison and analysis of data from diverse indigenous settings to delineate what is particular to a given situation vs. what is generalizable across indigenous populations and beyond. There are also considerable economies of scale and synergistic benefits to be gained from such collaborations, since many of the indigenous populations are relatively small in number and thus are seldom able to engage in large-scale research endeavors on their own. The success of this endeavor will be determined by the extent to which indigenous people continue to provide leadership and guidance such that we can forge a reciprocal relationship that has relevance and meaning in the local indigenous contexts, as well as in the broader social, political and educational arenas involved. By focusing on an agenda lead by indigenous students and scholars, with interdisciplinary, cross-institutional and cross-cultural research endeavors, the Indigenous Studies PhD Program is well positioned to ensure that the community, institutional participants and the infrastructure supporting them will move forward on a pathway to becoming self-sufficient and sustainable well into the future. Alaska Native Knowledge Network (2007) ‘Indigenous Higher Education’ <http://www.ankn.uaf.edu/IEW/ihe.html> (accessed 24 May 2008). Alaska Rural Systemic Initiative (2005) AKRSI Annual Report (Fairbanks, AK: Alaska Native Knowledge Network, University of Alaska Fairbanks). Arctic Council (2004) Arctic Human Development Report (Copenhagen: Arctic Council). Barnhardt, R. and Kawagley, A.O. (2005) ‘Indigenous Knowledge Systems and Alaska Native Ways of Knowing’, Anthropology and Education Quarterly 36, no.1: 8-23. Barnhardt, R. (2002) ‘Domestication of the Ivory Tower: Institutional Adaptation to Cultural Distance’, Anthropology and Education Quarterly 33, no. 2: 238-249. Barnhardt, R. and Kawagley, A.O. (1999) ‘Education Indigenous to Place: Western Science Meets Indigenous Reality’, in G. Smith and D. Williams (eds) Ecological Education in Action, New York: SUNY Press. Battiste, M. (2002) ‘Indigenous Knowledge and Pedagogy in First Nations Education: A Literature Review with Recommendations’, Ottawa: Indian and Northern Affairs Canada. Gutierrez, K. D. and Rogoff, B. (2003) ‘Cultural Ways of Learning: Individual Traits or Repertoires of Practice’, Educational Researcher 32, no. 5: 19-25. Helander-Renvall, E. (2005) ‘Composite Report on Status and Trends Regarding the Knowledge, Innovations and Practices of Indigenoius and Local Communities: Arctic Region’, Geneva: United Nations Environment Program. James, K. (ed) (2001) ‘Science and Native American Communities’, Lincoln, NE: University of Nebraska Press. Kawagley, A. O., Norris-Tull, D. and Norris-Tull, R. (1998) ‘The Indigenous Worldview of Yupiaq Culture: It's Scientific Nature and Relevance to the Practice and Teaching of Science’, Journal of Research in Science Teaching 35, no. 2: 133-144. Kawagley, O. (1995) ‘A Yupiaq World View: A Pathway to Ecology and Spirit’, Prospect Heights, IL: Waveland Press. Kullerud, L. (2005) ‘UArctic Strategic Plan’, Copenhagen: University of the Arctic. Krupnik, I. and Jolly, D. (eds.) (2001) ‘The Earth is Faster Now: Indigenous Observations of Arctic Environmental Change’, Fairbanks, AK: Arctic Research Consortium of the U.S..
Pfirman, S., Bell, R., Turrin, M., & Mare, P. (2004) ‘Bridging the Poles: Education Linked with Research’, Washington, D.C.: National Science Foundation, Office of Polar Programs. Stephens, S. (2000) ‘Handbook for Culturally Responsive Science Curriculum’, Fairbanks, AK: Alaska Native Knowledge Network, University of Alaska Fairbanks.